Vision Grills Pro Kamado Barbecue Bundle Grill is an affordable, compact and a high quality product for your backyard grills and outdoor parties. The grill comes with stainless steel flip cooking grate; to able the users achieve direct and indirect cooking. Two drop down side shelves to provide users with utility space they need while cooking. The shelves are coated with polyurethane to resist wear and tear. The lid comes with installed temperature control dials to help in maintaining and adjusting heat and temperature inside the grill. The port has been specifically designed to facilitate the users to use an electric starter for lighting the grill. The grill is inclusive of a heavy-duty powder coated cart and vinyl cover, to prevent fading with time. The grill has a visual appeal and will set in well wherever the users would like to place it. To read, adjust and maintain right temperatures for cooking, the lid has been fixed with calibrated top vents and dials. This process is easy and very user-friendly. The drop down side tables are durable and are very handy for the users to place all kinds of things needed while cooking, plates, spices, meat cuts etc. The grill may require users to practice and gain some expertise before they can fully adjust and control temperatures for low and slow smoking. The users might also experience that fuel burns out too quickly to do low and slow smoking. Users might face some difficulties in placing the electric starter and attaching the ash drawer housing. It may take users time to fix them properly. There is also a possibility of a sooty condensation leaking through the electric starter port and creating a mess around the area where users are cooking. Vision Grills Pro Kamado Barbecue Bundle Grill is a high quality unit that comes with a very affordable price. 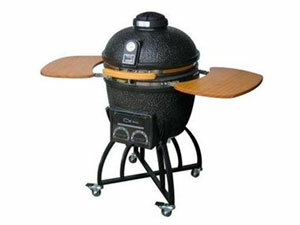 With high quality metal and ceramics used in the grill’s construction, users can enjoy grilling for many years. It is ideal for people who want maximum features in a grill that enhances their cooking and grilling experience, but stays within an affordable budget. Use the gadgets and equipment with care and learn how to use them properly for making best quality foods.